I went outside at 11:00pm - to my garden in South Florida. It is SO warm and moist that, even without moving much at all, I am covered with sweat. I can feel it dripping down the middle of my back where my spine is. I use a flashlight - even though I am a nature lover, I'm not crazy. 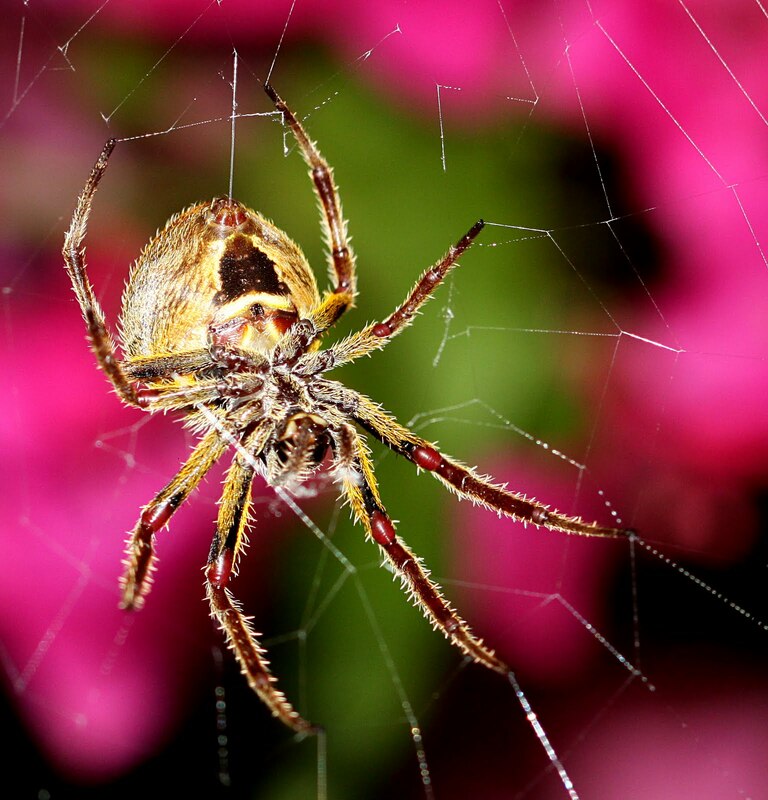 The last thing I want to do at night is walk through a spider web and imagine the owner is crawling around somewhere in my hair, or worse, near my neck. I approach my bougainvillea and search for anything moving around at night. I've seen baby possums before, cute as can be, but not tonight. Not yet, anyway. Maybe later, when I'm asleep. Suddenly, I notice a spider web, very typical, round shaped, several layers of "string". Then I see the spider itself - it's HUGE. Not as big as a Golden Silk spider, but sneakier because the Golden Silk is out all the time, day or night. It doesn't feel the need to only come out at night. This one, however, I've never seen before. It's a Hentz's Orb Weaver. I ran in and retrieved my camera and tripod. I even touched the web with my finger - and the spider got a little nervous. He knew it wasn't food, he knew it was some dumb human with a flashlight bothering him. I swished a few unsuspecting moths away and set up the tripod and camera. I got a few photos, using flash. 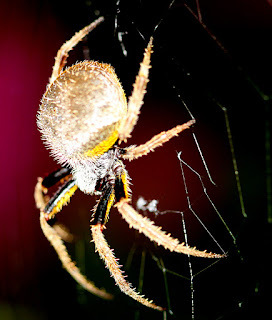 After awhile, Mr. or Mrs. Hentz Orb Weaver became quite blase about my photography attempts, including my flashlight intrusion. He/she became quite proud and made sure I got the full underside view, web spinner and all. I'm SO glad I didn't walk through this one, but saw it and got to photograph it and not have to wonder where the heck it went. As a matter of fact. Mr./Mrs. 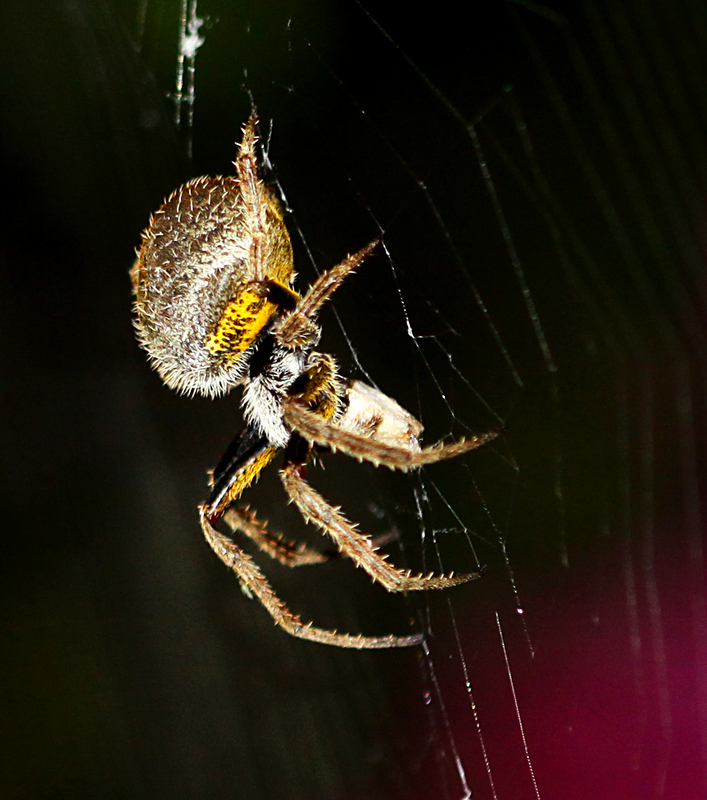 Hentz Orb Weaver is still out there hoping for a late night snack - and no more silly humans intruding. This spider is about 3" from end of leg to end of leg on opposite side. Just so you know, I think I'm going back out in a little bit. I haven't plumbed the total depths of my garden. I know in one corner there are sleeping Zebra Long Winged butterflies - several hanging upside down in a sheltered area. In the morning before the sun comes up, but it is light, you can see them all hanging there, waiting for the warmth of the sun. Oh - and we have a one eyed Bufo frog. There are a few of them that think the small water filled tub with fountain is their "spa", and they can always be found there. I know they are invasive, but they eat Palmetto Bugs, and, as much of a nature lover as I am - I do NOT want those babies (Palmetto bugs, a.k.a., huge roaches) anywhere near my house. 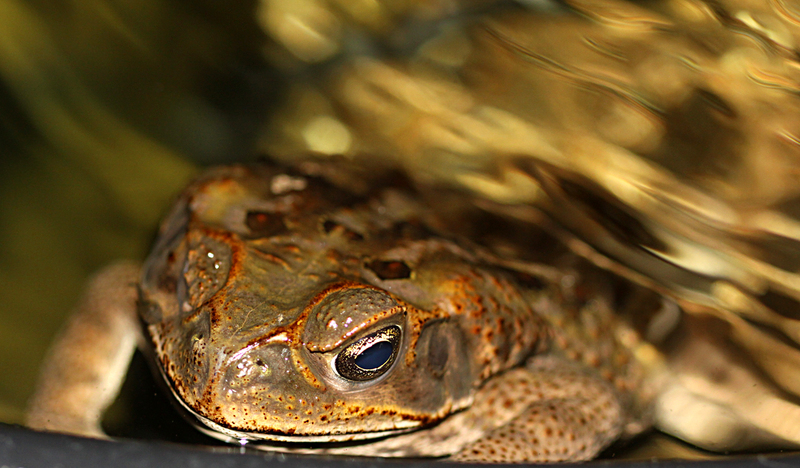 Here's Mr. Bufo - he loves eating flies. I only photographed his "good side", not the side without an eye. After all, he has his pride, too. That spider is waaaaaay too big for me. Yech!!! !